We were sent two Sigg water bottles to review. These bottles have beautiful and cute designs respectively, yet I can’t help but feel paranoid about the lining in the bottles and distrust for the company. Sigg has been a brand many people gravitated towards for reusable metal water bottles because they are made in Switzerland rather than China. This manufacturing origin does appeal to me as well, yet the company’s previous deceit over BPA in their lining is a cause for concern. As you may know, the BPA issues surrounding Lexan plastic bottles (polycarbonate #7) involve the migration of chemicals from the plastic into the contents of the bottles. On the other hand, SIGG bottles have been thoroughly tested in Europe to ensure 0% leaching of any substance – no trace of BPA, BPB or any phthalates. Two years later, the company admitted it contained BPA all along and offered to swap old bottles for newer ones. Where does that leave us now? With precise Swiss craftsmanship, SIGG’s are constructed from a seamless piece of pure aluminum which is inherently eco-friendly as aluminum is an abundant element in the earth’s crust. Therefore SIGG bottles are completely recyclable at the end of their long lives and do not contribute to our already over-populated landfills. The nonporous interior lining ensures that it remains taste and odor neutral so there won’t be any residual taste. My kids love the designs on these bottles! They were very excited when we opened the box! True, these aluminum bottles are much lighter weight than stainless steel ones. I took one backpacking for this reason, only to hear from my friends how toxic my bottle was! Sigg has an image problem. It’s hard to trust a company that blatantly lied and profited off of our health concerns. Since aluminum requires a liner to protect us from leaching, Sigg has introduced a new liquid based liner. SIGG Switzerland AG is proud to announce that we have transitioned from a powder-based liner to a new liquid-based liner. 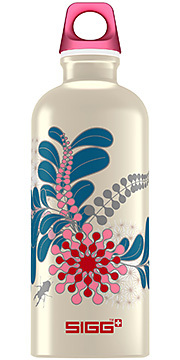 Beginning March 1st, 2012 all SIGG bottles manufactured will use the new liquid-based liner. The liquid based liner provides all of the benefits of our previous powder based liner while improving our production capacity and efficiency in order to better satisfy global demand; this information is available on our global website www.sigg.com/about-sigg/knowledge-base/faq/. The liquid based liner, as was with our previous powder based liner, is manufactured using BPA-FREEand PHTHALATE -FREE ingredients and insures there is no leaching, metal migration, and taste transfer. All one tastes is the beverage put in to the bottle. You will our find our testing and supplier certifications on the SIGG Switzerland website by clicking here. SIGG is committed to continuous improvement in manufacturing and our transparency to our loyal retailers and consumers. The new EcoCare liner by SIGG is comprised of many ingredients. The primary compounds utilized are a special combination of ultra-thin layer forming co-polyesters, many of which are commonly found in different variations across a variety of well-known food and beverage brand products. The materials used in producing the liner are BPA-Free and Phthalate-Free, as well as being free of any VOCs (volatile organic compounds). All ingredients used in the formulation and manufacturing of the new EcoCare liner by SIGG comply with the required EU and FDA guidelines, including EG 1935/2004 and FDA 21 CFR 175.300. To see testing certificates showing compliance, please click here . Sigg has been around since 1908. I do think the company has moved towards transparency. I do prefer Swiss made over Chinese manufacturing, but I have a hard time forgetting or forgiving the past deceit of the company. I bought a Sigg bottle in 2008 and again in 2009/10, do you think these bottles contain BPA? Is it still possible to swap them or return them to Sigg? I’m not seeming to find an answer to either question. Cheers and thank you for posting! I think I read somewhere that the exchange program ended, but you can contact the company and ask. mysigg.com should have contact info. Also, there is a way to tell by looking at the lining. Thank you for posting the links, can’t wait to see how this turns out… if nothing else, I’m certainly going to replace them, just want to see if Sigg will do anything.